Calling an outdoor restaurant at the Yumbo Centre Windsor Garden is a mystery to me. Neither is the menu typically British, nor the interior. We "enjoyed" another uninspired pizza here, with a pint of German beer. Hardly haute cuisine (as the rest of restaurants at the centre). 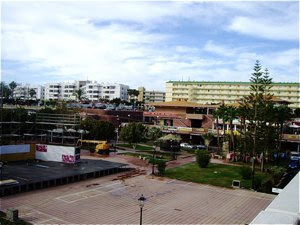 Windsor Garden is found on the top level of Yumbo centre, one out of four large centres at Playa del Ingles. It is located on the western part of the centre , and is is a little closed in. It is hardly the most charming or romantic place to dine, but the location is good – at the heart of the resort. Decent service. We could choose from a menu in many languages. We were served without delay. 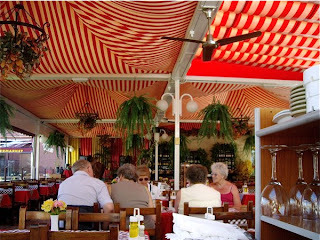 It was an open, outdoors restaurant, with a sort of Canarian, Spanish interior details. Oak-coloured chairs and tables. Red curtains. Brightly coloured canvas roof that could be folded up if nice weather. Large ferns hanging in baskets. 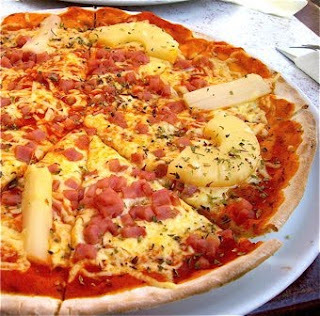 We ordered pizza with ham, pineapple, and white asparagus. It looked great. Brightly coloured ingredients on a thin, Italian style pizza crust. Crust deliciously thin, but the cheese a little undercooked and stringy. Very little contrasting tastes except the sweet pineapple that was a little overpowering. The pizza at Windsor Garden was boring, the ham did not provide enough salt to make it a too interesting experience. 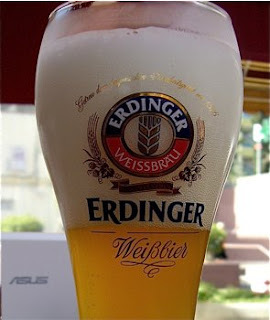 I ordered a pint of Erdinger Weissbier. This under fermented amber coloured beer is slightly opaque, and is very rich, with sweet fruity aromas. A delicious and refreshing drink in the heat. Erdinger was hardly the best choice to the pizza at Windsor Garden. It overpowered the under seasoned pizza. A lager would have been a much better choice. Windsor Garden is a place not to try pizza. It has few big assets, all in all. Decent location, and reasonable prices are a few. The rest is best described as mediochre. Windsor is OK for a snack for those of you with low expectations, except satisfy primary hunger. It may nog be fine dining but Windsor garden serves good quality tourist-food for a cheap price. The Serloin steak I had was well sized, tender and tasty and was served with crispy chips, a good garlic butter and a fine salad. That all for 10 euro's is a good deal to me!